Are you a very organised person? Do you always like to plan ahead so that you can avoid any mishaps and make the best use of your time? And, do you struggle to function without coffee? Listen up then, because this article contains a selection of coffee makers that are right up your street. And the key feature that these machines have is that they are all programmable. A coffee maker that you will fit into your organised lifestyle. A device that you can program to turn on automatically in a few hours time or tomorrow morning. Now before we take a look at these coffee machines, let’s find out more about programmable function. A coffee maker that is programmable can turn on automatically at some point within the next 24 hours. This feature is great for people who don’t want a coffee immediately but they know that they will want one in the morning or when they get home from work. And let’s face it, there are few things more annoying than trying to get a cup of coffee just as you are rolling out of bed or arriving home from a hard day at work. Although the feature that is of most interest in my selection is a timer, there are a few other features which can be found in all of the coffee makers in my comparison. Brew Strength is the ability of a coffee maker to adjust the strength of coffee by altering the amount of water that it adds to the brew. Fancy a whole pot of coffee? Or just one cup? Are you in a rush and cannot wait for the whole pot of coffee to fill? All the coffee makers in my comparison have brew pause. Coming from the coffee powerhouse that is Keurig, the K575 single serve coffee maker boasts an impressive collection of features. Although these extra features do mean that this coffee maker is a bit on the pricey side, this is generally a well respected machine. It could be argued that its timing feature is one of the most basic features of this machine. Nevertheless, it will still start automatically at any point within the next 24 hours. And looking at the comments, the program function is one of the most highly rated features of this model. You will never buy a Keurig because of their good looks but it’s plastic design is easy to clean and inoffensive. But what other features does it offer? Pod Power– Do you find ground coffee too fiddly and messy? This machine uses a massive selection of pods. Touch Screen– Forget buttons. This puppy is controlled via a 2.8” color touch screen. 80 oz Water Reservoir- Is filling the water reservoir a chore? With the K575, you won’t need to. Flexible Sizes- The K575 will make you a 4 oz. cup or a 30 oz. carafe and most sizes in between. Strength Control– Do you sometimes crave a coffee with more of a kick? Just brew a “bolder” cup. This is a must buy for all those Keurig fans out there who want a coffee machine with a 24 hour time. It is a great choice for K Cup and single serve users. The Cuisinart DCC 3400 has a 24 hour hour program function which enables it to be automatically started at any point within the next 24 hours. And judging by the reviews, this is a much liked feature of this machine. Like most coffee makers out there, the Cuisinart is a mixture of stainless steel and black plastic which means that it doesn’t really stand out design- wise. But it has an attractive digital display which is surrounded by a collection of cool looking buttons. Added to that it’s corners are curved lending the machine a softer look. As well as it’s programming functions, this device comes with a range of power features that you will not find on coffee makers. Adjustable Warming Plate– Set your warming plate to high, medium or low so that your coffee at the perfect temperature for you. Brew Strength– At the press of a button, you can make a bolder and stronger coffee. Flexible Volume- Although this machine can brew up to 12 cups of coffee, it is flexible enough to also brew 1- 4 cups. Brew Pause- Can’t wait for a full pot of coffee? With brew pause you can enjoy a cup of coffee before the brewing cycle ends, without making a mess. Self Cleaning- This Cuisinart model will also clean itself. Now that it what you call handy. If you crave a coffee machine with a timer that brews pots of coffee with no nonsense, then you won’t go too far wrong with this. The cuisinart SS15 is a totally different coffee animal from any other machines in my comparison. But what of its program function? Well, it can be programmed to turn on automatically within the next 24 hours and it can be programmed to turn off anytime up to 4 hours after this. The design is nothing to write home about, with a run of the mill mix of stainless steel and black plastic. It does, at least, offer a few alternate color schemes- including copper and black stainless. Which will suit any kitchen or none at all! The SS15 is a two way brewer, which means that it can brew a full pot of coffee or just a single cup of coffee and it has dedicated space for a thermal carafe or a travel mug. What are its other star attractions? Glass Carafe- With room for 12 cups of coffee, which is BPA free and it has a stainless steel handle. Gold Plated– Bored of constantly ordering paper filters? A gold plated filter can last forever. Temperature Control– Your coffee is guaranteed to be brewed at the optimal temperature. Strength Control– Choose between regular and bold brew strengths. This is a very attractive coffee machine for a person who regularly drinks coffee on the go and makes a full pot of coffee when they are not in quite such a rush! Let’s face it, the DLX1050B will not win any beauty contests but as one of the cheapest devices in my comparison, if you want a coffee maker with a timer and not much else and you are on a tight budget, then you might want to take a closer look at this model. With only a few presses of a button on the front of this machine, you can plan to the nearest hour and minute that you want the DLX1050B to automatically turn on within 24 hours of the current time. Brew Pause– if you cannot wait for the coffee pot to fill to the top, you can temporarily pause the brewing process to sneak a cup. This is the machine for the buyer who is on a budget. Someone who is looking for a no frills programmable coffee maker that makes good coffee. The Ninja CE201 is another in a long line of coffee makers with a drab design. But, it has a 24 hour programming function and so that ticks one of your biggest boxes, right? Although it is stainless steel (much like the Cuisinart DC3400) it also has lots of black plastic on view and black plastic can never be stylish. In terms of price, in my comparison it is mid range. Review- wise, this is a very highly thought of coffee maker. And so, what else do you get for your money? Strength Control– Choose between a standard or rich strength of coffee. Big or Small– This 12 cup machine can also brew a smaller 4 cup batch. Exquisite Brewing– Consistent temperature, blooming and saturation techniques all play a part in the brewing process. 60 oz. Water Filter– It can be removed to allow you to fill it with ease. Brew Pause– Can’t wait? Just remove the carafe and pour yourself a cup. This coffee maker is ideal for a drip coffee fan who wants a programmable machine that makes a great cup of coffee. Coffee Filters have become a very important part of making the perfect cup of Joe and they have developed a lot over the years. The very first coffee filter was created way back in 1908 by a German housewife named Melitta Bentz, who become frustrated by the bitter taste you get from boiling those loose grounds, so developed the first ever paper coffee filter. After realising how great this new paper coffee filter was, she patented it and went on to create her own paper filter company, selling small to begin with, before expanding further afield. 110 years later there are a wide range of different coffee filters for a coffee lover to choose from and I am going to help you find the perfect filter for you. When it comes to choosing the right paper coffee filter for you, then you really need to choose between one of these three types; Bleached, Unbleached, and Bamboo. The bleached paper filter is not too different from the unbleached paper, with the biggest difference between the two being, you guessed, the bleached being bleached white, while the unbleached is not. There are two main ways in which a bleached paper filter is actually bleached. The chlorine bleaching, which is seen by many as being very damaging to the environment, and then the oxygen bleaching, which will still not great is seen to be much better for the environment than chlorine bleaching. Be sure to keep an eye out for which bleaching technique has been used on your bleached paper filter. There is no denying that, while the unbleached paper filter might not look quite as attractive as the bright white bleached filter, it is so much better for the environment. Unbleached paper filters do not require the same high level of processing as bleached filters, which is why they are that much more environmentally friendly. Meanwhile, the taste of an unbleached filter can be a lot more papery than that of a bleached filter, but with a good rinse you should be able to get rid of that paper taste and all will be well with the flavour of your cup of Joe. Now bamboo filters are something which is relatively new compared to your bleached or unbleached paper filters and one of the best things about the bamboo filter is the fact that it is extremely environmentally friendly, with the bamboo being a completely renewable resource. Made from 60% bamboo and with absolutely no chemicals, the bamboo filter is the way to go for the good of the planet. As for the taste and flavour, many feel that the bamboo filter actually makes a better tasting cup of Joe than its rivals, so it really is regarded as the best paper filter out there. While the paper filter is the original king of the coffee filter world, there are now many people who much prefer to use a permanent filter, with there being three types in particular which you will want to consider: Gold, Stainless Steel, and Nylon. When it comes to the gold plated permanent coffee filter, they are basically the same as the stainless steel filters, just with the fact that they have a gold plating. This type of filter is easy to fit and remove, making it easy to clean. When it comes to the taste of the coffee when using a gold filter, it lets very little amounts of the coffee grounds through, while still letting the coffee keep those natural oils for a great tasting cup of Joe. There are some very high quality gold plated filters out there and the better the quality, the better the taste of the coffee. As we just mentioned, there is not too much of a difference between the gold plated permanent filters and the stainless steel filter, with both doing a very similar job. With that said, it does seem to be a common consensus that the stainless steel filter does seem to let a little bit more of the coffee grounds through, while keeping back some of those important oils, so the taste of you finished cup of coffee is not quite going to be at the same high level as that of the gold plated filters. With that said though, you can get your hands on a stainless steel permanent filter for much less than the price of a gold plated one, so it all depends how important flavour and taste is to you. he nylon permanent coffee filter is not really up to the same standards of the stainless steel or gold plated filters for a number of reasons. First off, the nylon filter is made of a synthetic material which makes it much harder to clean than the other two mentioned. As well as that, it is simply of a much lower quality and will not last anywhere near as long as the others. Finally the taste, it does not take too long for the nylon filter to start giving you an acidic taste to your cup of coffee, which nobody wants. With that said, the nylon filter is much cheaper than the gold or stainless steel filter, so again, it really is up to you to decide what is the most important for your cuppa. Finally we have the cloth filters, which seem to be a bit hit and miss with coffee lovers but, if cloth filters are what you are after, then you again have three which you might want to look at: Cotton, Hemp, and Muslin. While the paper coffee filters are the original of the coffee filter world, it is probably fair to say that they have been surpassed by the other filters out there. The cotton filter lets through much more of the natural oils than the paper filters but not quite as much as the permanent filters, so it is somewhere in the middle of the two, giving you a better tasting coffee than the paper filters but not quite up to the standard of the permanent filters. The same can be said for the cleaning process, as it is easier to clean than the paper filters, but not as easy as the permanent filters. Then we have to price which, as you can of course guess, is somewhere in between the two again. With the hemp coffee filters you can kind of take on board everything we have said about the cotton filters but there are a few differences. Some people have found that the hemp filters do tend to start to fall apart after a while, which can lead to some bits ending up in your cup of coffee. There have also been some complaints that they are much more difficult to clean than the cotton filters. With that said though, if you are willing to take a bit of mess on board and keep renewing your filter every time it falls apart, then you can get the hemp filters for quite a low price. Not a great filter but probably a small step up from the paper filters. Again, with the muslin coffee filter you are going to find that there is going to be a lot of cleaning involved with them but, unlike the hemp filters, it seems that the muslin filters are actually much easier to clean and can take a lot of cleaning before they start to deteriorate in quality. Many people seem split on whether muslin filters or cotton filters are the best of the cloth filters, so it really does come down to personal preference. The muslin makes a solid tasting cup of Joe and is not too expensive either but, if I had to recommend one to you, the cotton just edges it for me. When it comes to choosing the size of the coffee filter you want, you have so many different options to choose from, it all really depends on the amount of coffee you are looking to make. The typical cone sizes are #1, #2, #4, and #6, with the bigger of the filters being able to make up to around 12 cups of coffee in one useage. Be careful not to opt for a cheap coffee filter though, no matter the size, as you will find that they do not have the quality to deliver the delicious cuppa you are after. If you ever find yourself without a coffee filter and no easy way of getting your hands on one, then you can use this technique to make your very own homemade coffee filter. All you need to do this is, your hot water source, you coffee grounds and then a nice clean sock. Step 2: Put the coffee-filled sock over your cup, with the lower half hanging inside. Step 3: Slowly pour your hot water into the coffee-filled sock. Step 4: Allow the fresh coffee to come through the bottom of the sock. Step 5: Enjoy your fresh cup of Joe. It really is that simple. An old sock does not need to be thrown away. Just make sure it is clean and then turn it into your new, homemade coffee filter. An old sock is not the only way that you can can make an emergency coffee filter. Here are a few other techniques that also work fine. It really is simple to just shape the napkins or paper towels into the shape of the filter and then use it in the same way that you would use an actual paper filter. It might not sound like the most hygienic way to make a coffee filter but, if you really are in desperate need of a coffee filter, then you can also use toilet paper in the same way. This is another great emergency replacement but remember, the finer the cheesecloth, the better the coffee, as less ground will make it through the filter. If you happen to have some fine cloth around, make sure to clean it up and then fit it into the coffee filter shape. Be sure to use one that is going to be able to let the water run through but not the actual coffee grounds. The Cuisinart Brew Central is a simple, classic machine that uses a permanent, removable gold-tone coffee filter. This ensures smooth coffee with the convenience of being dishwasher safe. Along with being machine washable (much like its 12-cup glass carafe), gold-tone filters are made to last, and make your life easier… no more wondering if you picked up coffee filters on the way home! This machine is compact, to the point and has a classic stainless-steel exterior. Its additional features are pretty standard. If you don’t feel like waiting for an entire pot to brew, you can utilize the brew-pause feature as well as small batch brewing. If you are looking for a mid-range coffeemaker and hate the idea of waste, due to using paper filters, the Brew Central is a great choice for you. Thousands have chosen this machine as their go to for at home coffee brewing and customer feedback has been consistently positive. Most, love this machine for the pure coffee taste it provides. This is as a result of not only using a permanent gold-tone coffee filter but a charcoal water filter as well to ensure water is at its purest prior to being brewed. Complete with a custom measuring scoop, this machine uses a charcoal water filter and gold-tone coffee filter to brew your coffee. This keeps your coffee smooth, clear and properly proportioned. Existing owners really love this machines gold-tone, permanent coffee filter. It keeps coffee tasting like… coffee! And not plastic. This permanent filter comes with handle for easy removal. Once you’re done brewing coffee, just pull it out and empty any old grinds into the garbage or compost. Its exterior is black, with steel accents and although basic in its features, this machine offers some handy additions such as an ergonomic handle, knuckle guard and drip-free pouring. It is an affordably priced, mid-range machine, that is easy to use and environmentally friendly. With, of course, a permanent, removable coffee filter. These are just some of the reasons why it has become widely popular among consumers. This machine is well-liked overall, although it doesn’t have any real wow-factor. 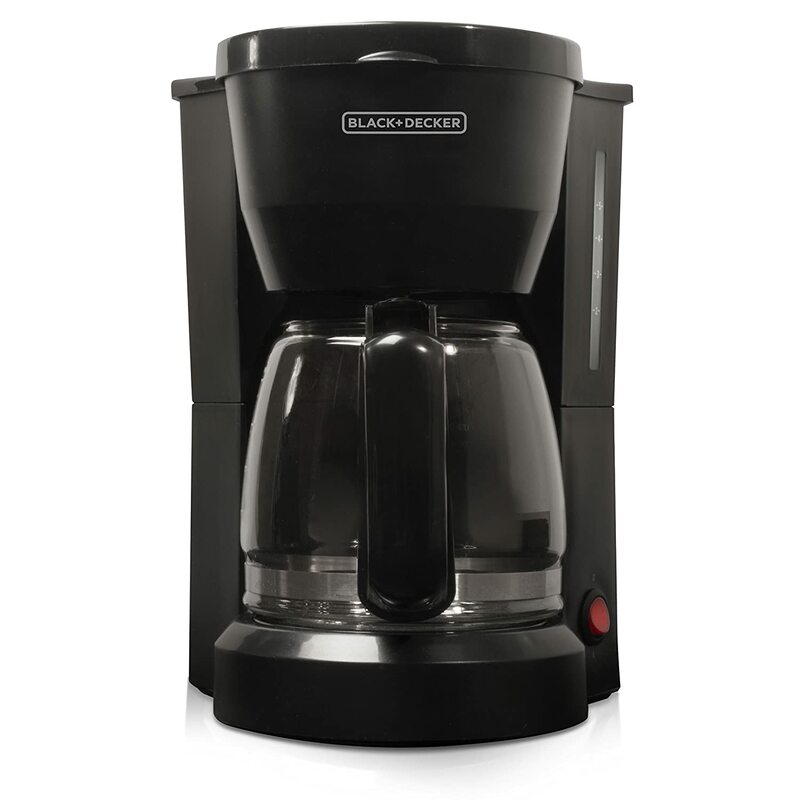 For a 12-cup pot-style coffee-maker, with easy-to-use controls, charcoal filtration and a permanent, reusable coffee filter, this is a great buy. It is priced very reasonably and great for the average coffee drinker who doesn’t want to use paper filters any longer. So, ditch the paper filters and enjoy a great cup of coffee from Cuisinart! Mr. Coffee wants you to enjoy pure, filtered coffee free of any chlorine-like taste. Pure tasting coffee starts with pure water and this machine from Mr. Coffee, filters water to ensure that up to 97% of its chlorine is removed. It uses a removable flat bottomed, basket shaped coffee filter for easy cleaning and to ensure all of your coffee grinds are completely covered in water when brewing. This also ensures great tasting and fully extracted coffee. Mr. Coffee has always made funky looking machines. And this particular pot-style machine is no different. It has a curved frontal profile highlighted by stainless steel accents. Its 12-cup carafe has a curved, ergonomic handle as well. With options for a thermal carafe to keep your coffee hotter for longer and such features as a freshness timer and automatic shut-off, consumers really like this machine. Thousands upon thousands have chosen to rely on Mr. Coffee for their morning cup coffee and are grateful for it. If any, criticism on this particular machine is that it could come standard with a gold-tone removable filter as opposed to a plastic one it currently comes with. Many users dislike the hassle of using paper filters and the taste they provide with the standard filter basket. Metal or nylon, reusable filters produce much better tasting coffee, not to mention creating less waste. For those who would like the added feature of a gold-tone, metal coffee filter, Mr. Coffee does sell one separately. It can easily be used in place of the standard plastic basket. With this addition, you can enjoy well-filtered water as well as clean tasting coffee without any papery taste or hassle that comes along with using paper or disposable filters. For a coffee-maker that has already amassed thousands of fans around the world, Mr. Coffee has you covered. Black + Decker knows appliances. They know their clientele just as well. They keep things simple and deliver what is important. And in this case, that is a coffee-maker, with a removable filter at an affordable price. So, how can you make the most out of this inexpensive, entry-level machine? By taking matters into your own hands an upgrading. In this case, you’ll be upgrading the removable, plastic coffee filter. This machine comes standard with a reusable, removable plastic basket with a flat-bottomed design. One that you would use paper filters with. But if you don’t want to use paper filters, then don’t! Simply purchase a metal, nylon or gold-tone coffee filter / basket separately and use it instead. Black + Decker uses a standard basket size, so replacements are easy to come by. And the great thing is, this machine is already designed for flat bottomed baskets, which are better for coffee extraction anyways. The result, is pure tasting, smooth coffee without the wastefulness or hassle of using paper coffee filters at an unbeatable price-point! Besides a very fitting, all black exterior, there is a water fill line and ON / OFF switch. That’s about it. The machine itself is small, simple, to the point and hassle-free. Most criticism from customers on this machine is misplaced, because for a machine as inexpensive as this one is, you can’t expect top-of-the-line performance. It’s perfect for dorms, small spaces or infrequent users. **Just make sure you use our coffee-filter life hack, if you want the get the most out of you Black + Decker 5-Cup coffee-maker! This machine is referred to as a ‘2-way Brewer’ although it offers many more options than just two. It is a pot-style, single serve, pod-style and drip coffee maker all built in to one! Two different sized, removable brewing baskets does in fact give you ‘2-way’ brewing although, the expression seems to sell the machine short. 1 removable, flat bottom basket allows for brewing of up to 12-cups of coffee without the need of paper filters. The other single-serve basket, actually doubles as a scooper… and triples as a pod-style soft pod basket! Remove the single-serve mesh basket to brew up to 14-ounces of drip coffee or insert a soft pod of any brand. Now that’s versatility! Resembling more of a science project than a coffee-maker, this unique machine pairs well with any modern kitchen and has a brushed steel exterior. It rates very high with customers as well, mainly for its versatility and ease-of-use. Are you looking to brew a whole pot of coffee? …great! Only need to fill up your travel mug? …even better! Do you want a single serving of coffee using any soft-pod on the market plus have the ability to fill up your brew basket with loose grounds if you so choose? …the Hamilton Beach 2-Way Brewer can help with that too! All this, at an affordable mid-range price-point and fewer design issues than that of its competitors. Hamilton Beach knows coffee-makers and knows how to deliver convenience as well… in more ways than one! A phenomenon in hybrid coffee-makers is here! Internally brewed, heated and stored, large quantity single-serve coffee-makers (also known as brew-stations) combine the convenience of pod-style single-serve machines with the quality of freshly brewed drip or pour over coffee. Store up to 12 cups inside your machine for hours on end without the need for a carafe or hot-plate and enjoy any size of coffee, whenever you want! Who can use a brew-station? With no cleanup and no chance of coffee-spillage, brew-stations are perfect for shared spaces such as offices, workplaces or environments in which cleaning, rinsing or possibly breaking carafe is out of the question. And with no plastic pods, brew-stations are a much eco-friendlier option than wasteful pod-style machines… plus, you get to drink delicious drip coffee as well! Just fill up your mug / cup and your off to the races. It’s that simple! If you own a business, have employees or drink coffee in a shared area… or just can’t be bothered to wash out a carafe regularly, then don’t! Ditch the pods, ditch the carafes and the hot-plates and make the switch to a brew-station instead! If you are new to the idea of brew-stations and want something functional with a sleek aesthetic to match on top of the convenient features a brew-station offers, the Hamilton Beach 12-Cup BrewStation is a great choice at an even better price. Brew and store up to 12 cups of freshly brewed drip coffee in its large, internally heated reservoir and enjoy a single-cup of coffee or re-fill your travel-mug whenever you want! Internal heating is gentle on your coffee and never burns or over extracts it like hot-plates can. The Hamilton Beach (48464 model) is extremely popular and is revered by happy consumers for its convenience, lack of potential cleanup from spillage and extra tall body; making it perfect for travel-mugs. There’s no need to adjust the drip-tray to fit in a tall cup or travel-mug. Its black with silver accented exterior, lets it blend into any professional workplace or business seamlessly. If you have a large household, drink coffee in a shared space or would like freshly brewed and well-maintained coffee at the push of a button, you’ll love this machine. The one-handed, pressure sensor lets you fill and re-fill your cup instantly. Feedback from consumers has been largely positive considering the large volume of units sold. Its one major critique is its seeming inability to keep coffee as hot as some would like (and as stainless-steel carafe might). This is just something that you may need to sacrifice in exchange for the convenience of drip coffee, available in a single serving and ready immediately. The Hamilton Beach (48464) BrewStation is a great way to break into the brew-station world without breaking the bank in the process. This compact and programmable brew-station is all about convenience. Pour one cup of coffee at a time with an easy-to-use actuator and keep an eye on your water level with viewing of its removable, double insulated water reservoir through a transparent window. Keep track of your brew-stations coffee level with a handy fill gauge. The Cuisinart DCC-3000 is small and has a modern look to it. It is an improvement on an older model (DCC-2000) and offers a more compact, clean design with smoother edges, making it great for workplaces and businesses. And if you want to use a tall cup or personal travel-mug, you can. Just remove the drip tray and fill your travel-mug. It is a perfect mid-range coffee-maker for those who you love the convenience of a single-serve machine but like to brew in bulk. It holds up to 12 cups of coffee at a time and water is ran through a charcoal filter prior to brewing to ensure the purest water possible. If any, criticism has been directed towards the sometimes-leaky push bar actuator, although the machine remains widely popular. Coffee snobs or those expecting perfectly bloomed coffee may turn up their nose at this machine, but for a mid-range, sleek, stylish coffee-maker that holds an entire pots worth of drip coffee that is ready at the press of a bar, this little device is a great choice! This is the older and possibly antiquated sibling to the Cuisinart DCC-3000. Offering Coffee-on-Demand with a convenient actuator press-bar and displaying your coffees quantity using a fill gauge, you can brew up to 12 cups of drip coffee at a time, which is easily enjoyable one cup at a time. With a blockier, more plain design than that of the newer version, the DCC-2000 does not offer the same sleek look. That being said, it still remains a good mid-range machine backed with a 3-year warranty! Self-cleaning, removable double-walled water reservoir, and small batch setting (1-4 cups) are all programmable features and come alongside that of standard brew-station qualities such as internal storage, heating and ‘carafe-less’ design. Like any brew-station type coffee-maker, it is ideal for you if you dislike the idea of possibly spilling coffee when pouring it from a carafe into your mug or don’t like using hot-plates to maintain your coffees heat. If you like the look, and can still get your hands on one of these machines, then great!… but there have been some improvements made to the newer, DCC-3000, model. The DCC-3000 has considered and improved mechanical issues, problems with the fill gauge meter as well as done its best to seal off any leaky actuator bar issues. Clean. Simple. Easy. These are all words that come to mind when thinking of the Hamilton Beach BrewStation coffee-maker series. They are a travel-mug owner’s dream and this model is no exception. 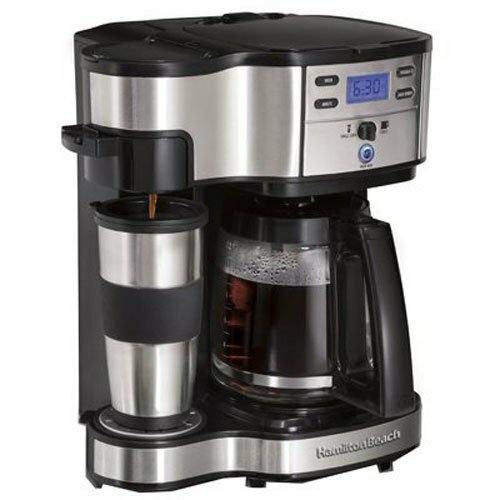 The Hamilton Beach (48465) BrewStation stores and dispenses freshly brewed drip coffee directly into your travel-mug or tall cup without the need to be adjusted for height. It is built tall enough for travel-mugs and makes grabbing a single-cup, or mug, easy with the one handed, pressure activated dispenser. It dispenses coffee straight into your mug without the need for a carafe or hot-plate and is heated internally within the machine. This means no hot-plate and no burnt coffee taste! You can use the transparent window on the removable water reservoir to keep track of your water level. It brews up to 12 cups of coffee and keeps it hot for up to 4 hours. Perfect for shared spaces with varying mug sizes, this is a busy-body or work headquarters type of machine. With the ability to grab a cup coffee quickly or make a pit-stop to fill up your travel-mug it acts as a real coffee station…. A brew-station if you will! It’s brushed-steel exterior with black accents makes it attractive enough for any setting and is priced low enough to give the BrewStation a try, even if you aren’t sure. Critiques from consumers include its low overall coffee heat as well as issues with the pressure activated dispenser dripping. This is bound to happen and is largely as a result of human error. (One note is to fill your travel-mug or cup on an angle to protect your hand from any excess coffee-drip). Plus, even if you do experience a little extra drip, that’s what the drip tray is for! As for the heat, that is something you may just have to sacrifice when investing in a brew-station at such an affordable price. But, if what you’re after, is to set up a station full of fresh tasting drip coffee that is easily accessible with for any sized mug for your workplace or shared space, you may have found it in the Hamilton Beach (48465) BrewStation. If you are someone that walks around town carrying a travel-mug, frequently walking into coffee shops and asking the barista to fill up your personal mug, then save some time and money by switching over to a brew-station! The Hamilton Beach BrewStation series has proven to be very convenient with its one-handed dispensing capabilities and tall frame. There are many machines in the series and they all have an easy-to-use design, sleek look and are perfect coffee machines for anyone that uses a travel-mug. This model, the Hamilton Beach (48463) is a great start, at an even greater price-point. It can brew, store and heat up to 12-cups of drip coffee at a time. Enjoy great coffee consistently and conveniently without the use of a hot-plate or the possibility of spilling while pouring from a metal or glass carafe. It has a transparent water fill line to let you know how much water in is the machine as well. Of the 3 Hamilton Beach BrewStation models reviewed here, this one is the least popular but ranks the highest. This is likely due to its lower price, will all the same features of the other 2 BrewStation machines. Critiques remain the same as well across all 3 machines; coffee not hot enough and drippy dispenser. These small critiques are to be expected, but the Hamilton Beach (48463) BrewStation is a great choice if you don’t mind a slightly less appealing aesthetic and enjoy paying a little bit less for essentially the same machine. In a previous post I wrote about the importance of water temperature when brewing coffee and how the perfect temperature ranges between 195 ℉ and 205 ℉. Knowing this is a great help because you can use this information when you are looking for your next coffee maker or for when you are boiling water for your next pot of french press coffee. In this post I want to look at the best coffee makers that have temperature control. Off the bat, let me say that these are not coffee makers that have thermal carafes or coffee makers that have warming plates that can be set to operate at different temperatures. Those machines only allow you to control the temperature that any coffee is stored at..
Coffee makers that have temperature control are machines that allow you to control the temperature that your coffee is brewed at. They are super-human by comparison. Which is the kind of control that any home barista worth their salt really desires. If you want to refresh your memory about the importance of temperature on the coffee brewing process, then read this. As you can imagine, there is a massive body of research related to coffee brewing and temperature how different temperatures affects flavor. So let me just provide an overview of that. The hotter the brewing temperature, the more full bodied and sweet your coffee will taste. Other ways of describing this flavor is chocolate-like and earthy. If this sounds like heaven then remember that hotter brews carry a greater risk of over extraction- which is when the sweetness turns bitter. Cooler brewing temperatures emphasise more of an acidic or fruity taste in a coffee. Now before we look at individual products, I want to look at some of the killer features that you will find in these machines. The features that I highlight below are stand out and special features. They aren’t available on every coffee maker in my comparison and the section isn’t another dull explanation of coffee pods and ground coffee. I am guessing that this is a feature that you are most interested in. Before you press start the brewing process, you can select the precise temperature between 187 ℉ and 210 ℉. The exact range varies depending on each coffee maker. And an indicator of how important the correct brewing temperature is, it is part of the SCAA certification. The speed with which water is added to coffee grounds is can be important in terms of creating the right flavor for your cup of coffee. And this model allows you to choose between one of three different rates. Blooming is the process that describes the initial release of C0² from the coffee grounds when water is poured onto them. Blooming is considered by some baristas to be an important part of getting the best flavor out of your grinds. This machine (link) has a pre soaking feature that allows you to do just that. Every now and again, we all just run of time. What we wanted to get done just doesn’t happen. If you are feeling rushed then this machine has a solution. At the press of a button it will make your coffee 25% faster than other similar machines. Even the biggest coffee lover, doesn’t feel like drinking it all the time. For those moments when you just fancy something else, use the hot water function on this machine (link) to make a cup of tea or hot chocolate. This little bad-boy is a busy, control freaks dream! It brews single-serve pod-style coffee hot, efficiently and allows you to adjust the brew temperature with the touch – or 3 touches – of a button. Just click the Settings button 3-times and then select your temperature between 187 – 192 degrees Fahrenheit. Also, it can brew a cup of coffee from a standard k-cup pod in under a minute! Its sleek and stylish design at an affordable price make it perfect for the office, at home or for your business. The versatility of temperature control on this quick-brewing pod-style coffee machine is rare and nice to see. In addition, you can choose between hot or iced-coffee and it comes with a hot-water system that purely dispenses hot water. This machine has been well received by consumers, with the only downside being its less than ‘piping hot’ brew temperature. Although the machine brews coffee very fast and the temperature is controllable, some would rather wait a little longer for coffee that brews hotter. The counter to this criticism… this is not what the K-Elite is all about! What it is about is elite speed and control within a simple design. Precision by name, precise by nature. The Breville BDC450 Precision Brewer is all about brewing perfect coffee the right way. This means, drip coffee brewed and bloomed at the perfect temperature. Even though it will automatically adjust to the perfect temperature of 195 – 205 degrees Fahrenheit while brewing coffee, and is recognized by the Specialty Coffee Association of America (SCAA), its capabilities go even further. Using a digital temperature control, you can select exactly what temperature you want your coffee to be brewed at and choose between 3 different flow rates as well. Even the time in which coffee is in contact with hot water can be personalized to your liking. ‘Precision Brewer’ is an entirely accurate way of describing this machine, and it is made for real coffee enthusiasts. Vary your drip coffees brew-strength depending on the type of roast you use and keep it warm for hours in the stainless-steel thermal carafe it comes with. This all stainless-steel machine, with matching stainless-steel body, carafe and filter doesn’t come cheap but is not over-priced in the slightest. It is definitely worth the money and is in the mid-high price range; very reasonable for such a precise and customizable machine. Some find the specific controls overwhelming, especially if you don’t vary your coffee options much, and don’t like to having to wait as long as you do for properly extracted coffee. All in all, feedback has been majorly positive. For those who appreciate a job well done, and the time it takes to produce great coffee, the Breville Precision Brewer offers just that, perfectly brewed, perfectly hot and completely customizable coffee! The name of the game for the Keurig K575 single-serve, pod-style coffee-maker is its selection of options. Options for brew-strength, temperature, brew size and even a hot-water-on-demand option as well. This compact machine with a stylish, modern aesthetic and large digital colour touch-screen is perfect for large households, businesses or offices. Being able to select from 5 different temperature options means anyone, with any style of k-cup coffee pod, on any given day can have exactly the type of coffee they want. This form of customization is really nice to see in a pod-style machine. It goes to show that Keurig not only cares about convenience, but offers customization to their customers as well. That being said, we need to be realistic and understand that coffee stored in, and brewed from, a plastic pod is not the same as freshly ground drip or pour-over coffee. And even though after thousands of reviews, the general feedback is positive on this machine, there are always those critics that expect it to produce coffee tasting as such. The Keurig K575 is a respectable machine at a respectable price. It is perfect for any grab-and-go coffee drinker who wants more customization out of their single-serve k-cup machine. If fully extracted flavour and consistency from your coffee beans is why you are interested in temperature control, then you will be very happy with this machine. Using a precise digital scale, you are able to select any brewing temperature between 195 – 210 degrees Fahrenheit. This means that you can not only brew piping hot coffee, but this SCAA approved machine allows you to adjust the brewing process to fit your specific coffee needs. Everything, including the pre-soak feature, is customizable. You can choose to let your coffee grounds bloom from 15 seconds all the way up to 4 minutes!… but the features for perfect coffee don’t end there. A stainless-steel water reservoir, thermal-carafe and exterior accents help this machine to not only look clean, but by ensuring coffee-taste purity as well. It does this by brewing your coffee without any direct contact to plastic during the entire process; from storage, to the brew to post-brew storage and all the way to your mug! This is truly a knowledgeable coffee connoisseur’s dream machine. If you know precisely what you’re looking for, in terms of great coffee, this is a great choice… just be careful when brewing your piping hot coffee as steam has been known to build up in the water reservoir and can burn you! What you get besides a conventional drip-style coffee machine with the Cuisinart DCC-3650 is adjustable brewing. Your 3 options are: Regular, Hot and X-Hot. It has a few other features as well, such as brew strength and 24-hour programmability. It’s ‘Extreme Brew’ feature, brews coffee up to 25% faster than machines like it, in its class. Customizable, with cool color options such as: Metallic Red, Copper, Black Stainless-steel and others, the main feature people like about this machine is its price. It is very affordable and comes with temperature control. Simple. Using a glass 12-cup carafe, this machine is for someone that wants a coffee-maker with control over their brew temperature without needing much else. It rates well overall with consumers (mainly for its affordable price) but is not something an avid coffee drinker, lover or connoisseur would go for. If what you need is a machine to brew coffee, at a great price, with a few features such as temperature control, the Cuisinart Elite 12-Cup drip coffee-maker will definitely get the job done! 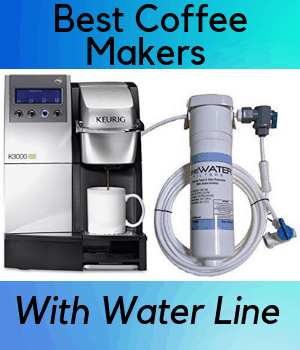 5 Best Coffee Makers With Water Lines- Ditch The Water Reservoirs! Do you work in an office where you current coffee maker just doesn’t cut it? Are you constantly filling the water reservoir in order to keep up with demand? Are your colleagues about to revolt? Perhaps you need a coffee maker with a water line. Although I review 5 coffee makers with water lines, for those of you in a rush, here is my favorite. What is a coffee maker with water line? A coffee maker with a water line is a coffee maker that has a direct connection to a cold water feed in much the same way that refrigerators, that have water and ice dispensers, are. These coffee makers are also called self filling coffee makers and directly plumbed coffee makers. It means that you will never have to fill a water reservoir ever again. Direct plumbed coffee maker are for high volume users. Situations in which so much coffee will be drank that it would be a full time job for a member of staff to keep the water reservoir topped up! I think that the most obvious need for a self filling coffee maker are work places where the machine could be used on an almost continual basis and where it just wouldn’t make sense for a water reservoir to be continually filled. But it is easy to see that there are other circumstances in which a coffee maker with water line would make a great deal of sense. Sticking with the workplace theme, a directly plumbed coffee maker would also make perfect sense in a food service setting, such as a staff restaurant or canteen. For instance, one of these machines could be installed in a house if the homeowner drinks lots of coffee and could has the necessary plumbing skills to connect the machine to the water feed. Or how about in an Airbnb rental? Wouldn’t a directly plumbed coffee maker make perfect sense? The coffee makers in my guide are suitable for any size of business- small, medium or large. The following features are some of the most common features to be found in the coffee makers within my comparison. Coffee is a very popular drink in an office but not everyone will want to drink coffee. You need a coffee maker that will make other hot drinks as well such as tea or hot chocolate. All of the coffee makers in my comparison have this flexibility. The Keurigs can make a variety of hot drinks because they use K Cups- a range of coffee capsules that number in their hundreds. The Brew Express machines can provide you with hot water on demand- with which you can make a lovely cup of tea or a tasty cup of hot chocolate. All three Keurig machines are K Cup compatible. The Brew Express machines use loose ground coffee and not any coffee capsules, such as K Cups. None of the coffee makers in my comparison have some of the features that you would find in coffee makers with a larger capacity. These include a place for spent cartridges, or used loose coffee grounds, or a reservoir for milk. In this section, I want to look at the benefits that coffee can bring to a workplace. A survey by Staples in 2016 showed that 25% of respondents would choose coffee over their smartphones and one in three of them would run down a street naked than give up their cup of coffee. Other benefits that coffee has include its ability to boost your productivity and it has been shown to add to a supportive workplace. All of the coffee machines in my comparison have official kits that can be purchased separately but they all cost quite a bit of money. However, if you can’t afford to buy one of these kits, then there are other options. And the video above shows a DIY hack that will add a water line to a Keurig. Just remember that there are risks involved in these “unofficial” hacks. In this section, I want to look at the advantages and disadvantages of coffee makers with a water line. To kick off, let’s start with the advantages. The most important pro is that the water reservoir will need to be manually filled again. This saves waiting times and it saves staff time because there is no need to manually fill the reservoir. I think that a directly plumbed coffee maker has three possible disadvantages. Firstly, there is a water quality issue. Your machine will have unfiltered water going into it. How good is your local water? You might need to add a water filter to your setup. And the final con is that you might need to pay for a plumber to connect the water line to your coffee machine. The first three coffee makers in my comparison are all made by Keurig and they are all almost identical. Because the way in which these three brewers are different is most important, let’s have a look at their differences. Most importantly, all three of these Keurig models can be directly connected to a water line but only one of these models comes with the necessary kit ready to go out of the box. And that is the K150P. The K150 and the K155 need a kit to be purchased separately. This kit includes almost all of the pieces, including a water purifier. On top of that, you will need to buy a new water reservoir. Just check that the 15” inches of water line are long enough to go between your water line and where you have located your Keurig. And unless you are very confident and experienced in plumbing skills, call a local plumber to come and connect if for you. The K150 and the K150P brew five different sizes of coffee- 4, 6, 8, 10 and 12 oz. servings. The K155 only brews four sizes- 4, 6, 8 and 10 oz. These models are almost identical in colors and design. In fact the K150 and the K150P are identical. And the K155 has a silver brewhead and not a black brewhead. Now, that we have looked at the ways in which these three Keurigs are different, let’s now switch our focus to the ways in which these machines are identical. All three of these machines have the same dimensions- 13.9 inches high, 14 inches deep and 10.4” wide. 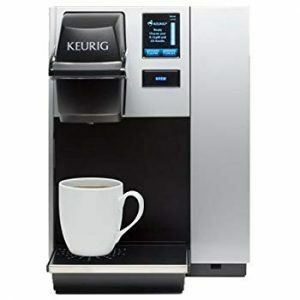 Although the main focus of these reviews is the ability of these Keurigs to connect to a water line, the water reservoirs that are built into them are large- 90 oz. This is just over 2.5 liters. The reservoirs are removable and have a lid on top of the reservoir that opens up so that water can be poured in from above. All of these coffee makers have a full color touchscreen. Unfortunately, I cannot find the exact dimensions of this color touchscreen anywhere! NSF or National Sanitation Foundation makes sure that food, water and consumer products meet strict safety standards. If a product has an NSF certificate, it has passed and exceeded those standards. The K150, K150P and K155 all have this feature. Auto on and off means that a coffee can be programmed to turn on and turn off at set times of the day or night. For instance, if it is used in an office you might want to program your brewer to turn on at 8 am, when people first start to arrive and turn off at 5.15pm when everyone has left. This feature is not the same as “energy saver”. This is another feature that all the Keurigs have. Energy saver is a function that can be toggled on or off. It enables the coffee maker to turn off when it is not being used. The brew temperature on these Keurigs can be changed. All of them are preset to brew at 193 °F but this temperature can be altered between 188 °F to 199 °F. So, how hot do you like your coffee? These three coffee makers are capable of using one of three languages; English, French and Spanish. Now that we have looked at the K150, K150P and K155 let’s move on and look at two coffee machines from a different manufacturer. There are two coffee makers from Brew Express which I want to review next. Brew Express are a much smaller company than Keurig, but they have manufactured two self filling coffee makers; a countertop coffee maker (BEC-110-BS) and a recessed coffee maker ( BE-110-BS). These two coffee makers are exactly the same in every way apart from the dimensions and the price. The recessed coffee maker has a much smaller “depth” because most of it is “buried” in a wall but it is also thinner and shorter than the countertop model. Firstly, the countertop model is much cheaper than the built in model. Both of these models can be connected directly to the water line. This kit is so simple that most people should be able to install it themselves, without using a plumber. And if you want to check out the video for yourself, look below. What are some of the other stand out features? Firstly, this coffee maker is SCAA (Specialist Coffee Association of America) certified. And that certification is the real deal. SCAA does not hand out these certificates willy nilly. In order to be successful, a coffee maker must pass several rigorous tests. And one of the most important is about how consistent the brewing temperature is. This is a blue night light that is controlled by an on/ off switch. Do you want a cup of coffee NOW and you don’t want to wait? This machine has an infrared sensor that means that you can take the carafe out without spilling coffee everywhere. This coffee maker brews coffee fast. It will brew a full carafe in a touch under 6 minutes and two cups in just over a minute. 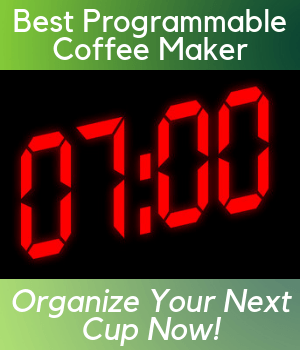 You can program the coffee maker to turn on or off at any time of day.